Do a Google search on self-defense gadgets and you’ll be amazed at the volume of items you’ll find. Anything from commonly known gadgets such as Pepper Sprays and Mace to items that seem futuristic and could very well become a reality in the very near future. I’m sure you are quite familiar with pepper spray and stun guns, but let’s look at a couple of the more uncommon and futuristic options. The ARMSTAR (pictured above) was inspired by the events of a 2004 mountain lion attack in California by inventor David Brown. The BodyGuard™ is a Hands-Free less lethal self-defense system worn on the arm. 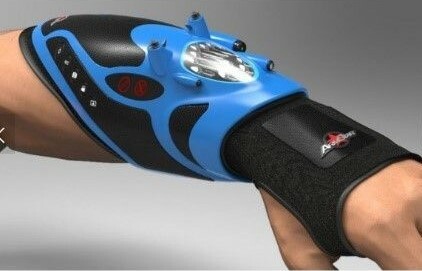 The forearm is protected by a platform equipped with a LED flashlight, green laser pointer, and camera for capturing evidence and identifying assailants. The basic unit also includes a stun device, activated by a pressure pad trigger in the palm of the glove. This futuristic looking device has attracted the monetary support of Actor Kevin Costner who felt that the product would be an asset to law enforcement and the military. A sexual assault survivor in Germany has created Safe Shorts, a line of underwear and running shorts designed to be slash and tear resistant. They are equipped with a padlock and a 140-decibel alarm. The alarm will trigger if tampered with by an attacker or the user themselves can set it off to sound an alert. The shorts were created by Sandra Seilz from Germany, who was attacked by three men while out running. Luckily for her, a man happened to be walking his dog nearby and chased the attackers away. The likelihood that you’ll actually use one of these products is slim, but knowing they are there gives us food for thought. You should always be thinking about what you would do in the case of an attack. Personal preparedness should be at the forefront of your mind if you are inclined to activities where you are going to be alone in remote areas or in a profession where meeting strangers in unfamiliar territory are likely to occur. There are many options available to the general population for personal protection and self-defense including online classes. Certified Training Institute offers an online Personal Safety and Self Defense course that you can take in the comfort of your own home or office. This four-hour course is designed to provide important safety tips and precautions for personal safety in the workplace. This is especially true for real estate professionals as they are very often in situations that expose them to unknown situations, with unknown persons. Instructor Preston Taylor has worked in law enforcement for over 20 years, is a Police Academy Instructor, and a Defensive Tactics Instructor for over 15 years. He has acted as a speaker/trainer for the National Association of Realtors and the Michigan Association of Realtors. This entry was posted in Personal Protection and tagged Safety, Self Defense.